'Our campaign brings together all those who believe everyone has a right to a decent affordable home to call their own. Our support comes from people across the country and we’ve joined forces with organisations from every corner of the housing world'. People came from far and wide to the rally. Supporting that campaign are companies who make a huge profit from social housing. One of those companies is the housing association Family Mosaic who is holding the threat of homelessness over the heads of three staff who work as support tenants and reside in Family Mosaic accommodation. It is doing so as part of its response to cuts in funding from Hackney Council, despite holding millions in reserves. 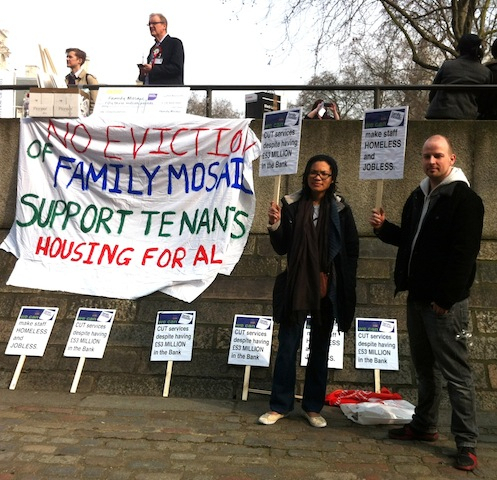 Protestors talk to a Family Mosaic manager about the threat to evict Tenant Support Workers living in tied accommodation. As visitors moved into the Methodist Church where the rally was being held they were greeted by comic actors, a lively atmosphere and supporters of the Support Tenants with a large banner that read No Eviction of Support Tenant Workers by Family Mosaic Housing for All. The banner caught the imagination of the press who snapped away and asked questions about the protest. The issue has already received coverage in the Hackney Citizen and interest from other sections of the media. 'Keep on campaigning if Family Mosaic really did what they said on their website which is 'care' they would find a way to not make four staff members redundant and homeless'. They suggested that Family Mosaic ought to employ the staff themselves out of their £53 million surplus rather then make them homeless and risk the lives of vulnerable service users. Both were concerned about the employees and service users and after hearing that Hackney Council had asked Family Mosaic to make 10% cuts they wanted to know what Family Mosaic had said to Hackney Council. They were unsure that Hackney Council knew the full consequences of ending the Support Tenant roles. They did not believe that the weekly support work carried out by the Support Tenants, who are lone workers, could be matched by already over worked Support Workers. They said they would be taking the matter up with Family Mosaic themselves. The staff, all Tenant Support Workers, live in tied accommodation. They have been told that they can move to almost identical posts, but will be evicted from their Family Mosaic owned properties. The staff, however, have made it clear that cutting these posts, as well as making them homeless, will have a serious and detrimental effect on the lives of vulnerable people who will lose the regular, face-to-face contact with support tenants employed to assist them. Removing support tenants would increase the pressure on mental health and generic health services, increase the workload for already overloaded social work teams, and would lead to increased isolation and problems such as debts and benefit problems.